Hi friend! I hope you had a magical weekend. I spent most of my weekend experimenting in the kitchen to create some yummy new treats to share with you. Whenever I’m away for an extended period of time I find I crave time in the kitchen to tap into my creative juices and because it helps me get calm and focused. In honour of National Ice Cream Day, which passed us by this weekend, I wanted to come up with a sweet treat to keep you cool. However, when I eat regular ice cream I bloat up so bad it looks like I’m smuggling basket balls under my clothes. Not an attractive look for me or anyone else who’s dairy sensitive. So what’s a girl to do? Raid her pantry for a high-fat dairy alternative, of course. Enter coconut milk! While coconut milk is rich and creamy, it contains fats that actually increase the beta-oxidation (burning) of stored fat cells in the body, which means… it can actually help you lose weight! The medium chain triglycerides, or MCTs as they’re commonly known, are readily absorbed by the body in the digestive tract and are burned as fuel by your liver, which means eating coconut oil and milk can help give your liver some love. These MCTs come in a few different specific forms, some of which have anti-fungal, anti-bacterial, and anti-viral effects in your body. One of these special fats, called capric acid, has antiviral and antimicrobial because it is converted to a substance called monocaprin in the body, which fights various bacteria, viruses, and even Candida albicans. In a bowl whisk together coconut milk, sweetener, vanilla, and pear until smooth. You can leave some chunks of pear for texture if desired. Add ginger, tapioca, and sea salt and whisk until combined. Using directions on your ice cream maker pour into the bowl and let churn for appropriate length of time (mine took about 35 minutes). If using ginger pieces, cut them quite small and add to mixer 5 minutes before churning process is set to be complete. Pour into freezer safe containers and let set for 2 hours . Note: If left in the freezer overnight, remove ice cream 10 minutes before eating to soften. 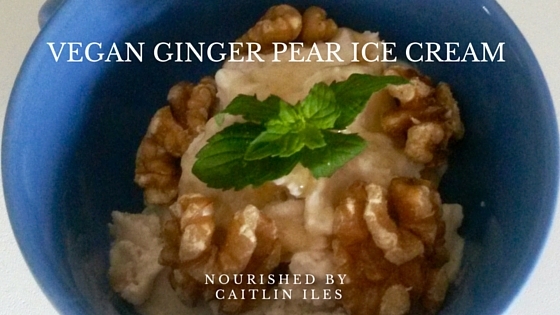 Well that’s the deliciously creamy, oh so nutrient-rich, summer indulgence recipe for today. Make sure you never miss a recipe by signing up for my mailing list. You get a FREE Sensational Summer Smoothies E-Book as a thank you when you join. Click here to join the fun! Thanks for stopping by and have a wonderfully whimsical week!